Silver Birch, a graceful tree at all times of year and one with so many uses. It's almost time to start collecting sap for this years wine and I can't wait. It's a strange thing that when you drink the sap straight from the tree it has a taste of silvery magical water - just a light filmy liquid. Then after fermentation it takes on an amazing quality and becomes one of my favourite crisp dry white wines. There is only a short window of time to gather the sap so keep an eye on the buds and choose your moment wisely or you'll miss out on one of the most delicious natural wine resources there is. This time of year when the Birch is flooding itself with water for bud burst is one of the best times to save different sized trunks from 1.5 inches upwards for these attractive little folk art pots. So called because the timber shrinks onto the inserted base and creates a tight seal (depending on the accuracy of your carving). If your efforts are precise and the seal is held firmly by the Birch when it's dry you should have a vessel that will serve you well as a perfect cup for your Birch Sap Wine. I find it amazing all the different colours and textures of bark but I do find it important to choose good straight pieces of timber. If you don't it can be a real struggle. It does take a bit of practise to get them to hold water but persist and you will succeed. Keep your knives exceedingly sharp - have a look at my movie for this if you're having problems with your curved blades Curved Knife Sharpening - this is a simple little movie but it's the way I sharpen my spoon knives which is what I use for carving out my shrink pots. Birch bark makes wonderful tinder for fire lighting and I always have some shredded in my pocket with a steel if an impromptu blaze is required. Many nations have made shoes and baskets from it with beautifully woven patterns - I admire these but weaving of bark is just not my forte - I leave it to the experts. Tar has been extracted from Birch for centuries and it's one of the reasons I don't use it in my wood burner or open fires here in Waltham Abbey. It does tend to tar up the chimney and having had a bit of a chimney fire many years ago I'm not quite so gung ho with using any old wood. I avoid any pine or conifer for the same reason and ensure that my wood for the home fires has been seasoned for at least three years. 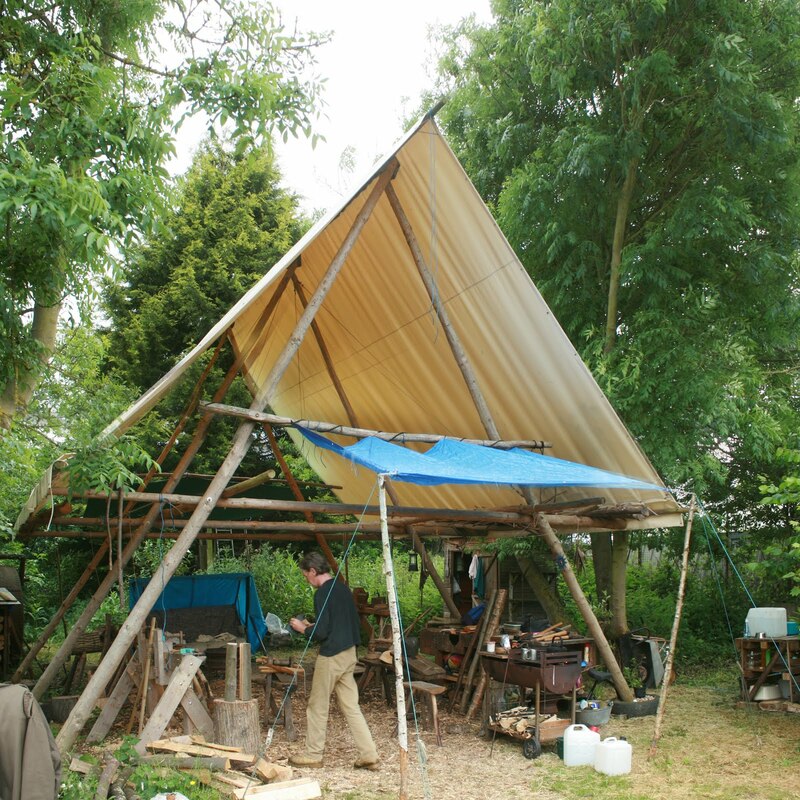 I've made lots of changes - my wonderful Woodland Workshop in the stunning Essex countryside is one. I do all my Pole Lathe turning here, three different lathes permanently set up including a bowl turning lathe, with another three all ready should I want a change but those I would say are my travelling lathes. Bowl carving has become a favourite pastime and I've constructed several Bowl Horses to meet all the different sizes and shapes I love to play around with.